Introduction-Outlook Express Password Recovery Software is the best way to recover all lost or forgotten E-mails or news group account passwords configured on Microsoft outlook and outlook express e-mail accounts. Password restoration tool is fully capable to restore all identity passwords from your local MS Office Outlook and Outlook Express Records. Affordable password finder utility retrieves all your Auto complete saved passwords hidden under the asterisks characters (regardless its length and complexity) and saves retrieved passwords list at user specified location for future reference. 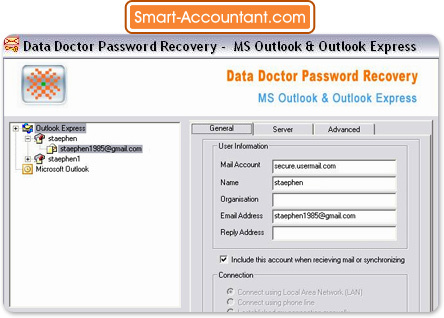 Outlook and Outlook Express Password Recovery Software is used for revival all users’ records (saved in outlook and outlook express) including incoming/outgoing server information, mail account name and passwords. MS Office outlook and outlook express facilitates to show multiple e-mail accounts at a time. Simple to access software utility is useful for those users who have multiple e-mail accounts and always tend to forget their passwords. User friendly software facilitates with systematic help menu for user’s assist. √ Restore lost or forgotten e-mail and news group account passwords of MS Office Outlook and Outlook express. √ Recover all passwords ever entered on your Laptop or Desktop Computer system. √ Revive all your entire lost passwords regardless their length and complexity. √ Record server information including incoming/outgoing server information, e-mail account name and passwords. √ Uncover and Unhide lost passwords behind the asterisk characters. √ Save all recovered password list in .txt file format for future use. √ Support all major versions of MS Office Outlook and Outlook express. √ Simple and reliable tool has user friendly graphical interface.